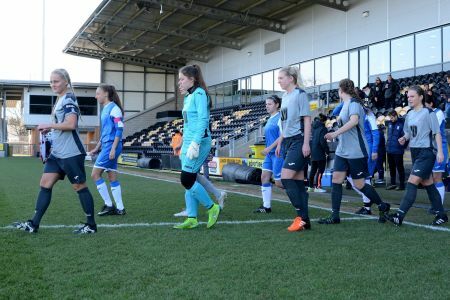 The Girls' U18 Colleges' and Schools' National Finals were staged at Burton Albion FC's Pirelli Stadium on the 16 March 2016 in a celebratory event based around the ESFA's support and dedication to Girls' Football. Throughout the day, various Girls' Junior Football Leader courses took place at St George's Park as well as a Continental Tyre festival in the stadium car park. Female match officials were appointed by the ESFA for both matches and She Kicks Magazine, the FA's Kelly Simmons, Birmingham City Ladies player Kerys Harrop and Doncaster Belles Emily Simpkins all supported the events throughout the day. 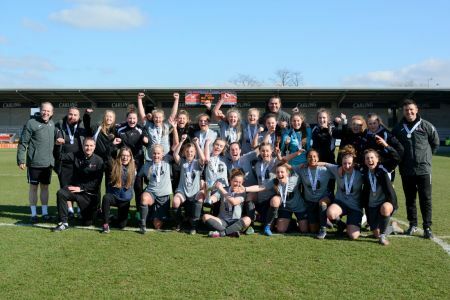 The Girls' U18 Colleges' Cup was the first match of two, which saw Accrington & Rossendale College take on Solihull College to become National Champions. Both teams started well in the spring sunshine, but had to contest with a strong cold wind. Solihull enjoyed the early possession but couldn't create any clear cut chance. Antonia Smith lobbed in a free kick from outside the box but Katie Maher in the AccRoss goal claimed it without any real issue. The lively left back Sian Johnson, Solihull's captain forced a number of corners but AccRoss defending resolutely. Ali Johnson took over for AccRoss having two attacks in as many minutes, both of which finishing with shots that missed the goal by less that a yard. As the pressure mounted on Solihull Ali Johnson finished off an excellent dribble by cracking a shot at goal from 20 yards which nestled in the bottom corner to the delight of her teammates putting them 1-0 ahead. Some strong running from Demi Devereaux produced a looping cross which bounced invitingly in the penalty area, but unfortunately no one was there to tuck it away. The second half started at a great pace, with both sides forcing goalkeepers to make saves. Ali Johnson was again the liveliest centre forward, fizzing a shot inches over the bar. As tempers flared and the tempo raised again, Chloe Peplow showed excellent feet and turned into space at the top of the box before smashing her shot against the crossbar. Jessica Carter made a great run and forced a free kick by the corner flag, her teammate took it quickly and found her as she took a snap shot and just pulled it wide. Solihull pressed on and forced more chances with Ellie Brazil pouncing on a loose ball from a GK clearance lifting it toward the open goal only to hit it with too much power. The next chance came by way of neat combination play between Emily Joyce who fed Ellie Brazil only to be fantastically thwarted by AccRoss goalkeeper Katie Maher. As AccRoss tried to contain Solihull Katie Harrison played a perfectly weighted through ball to Ali Johnson for a breakaway who should have ended the game, but shot across the goal and wide. As the game entered the last ten minutes both teams had chances and Solihull caused chaos in the AccRoss box with a corner that fell right at the goalkeepers feet, but no-one was on hand to finish the attack. Try as they might, Solihull just couldn't get the rub of the green as their last few attacks sailing just wide. The referee blew the final whistle moments later and confirmed the girls in grey were the national champions! The match was recorded by 247 and streamed live from the ESFA YouTube Channel (ESFA TV) and can be found here. Photos on the day were taken by Garry Griffiths and are available for purchase by clicking here or by searching for ThreeFiveThree photography. 31st :: A Weekend of International Entertainment Ahead! 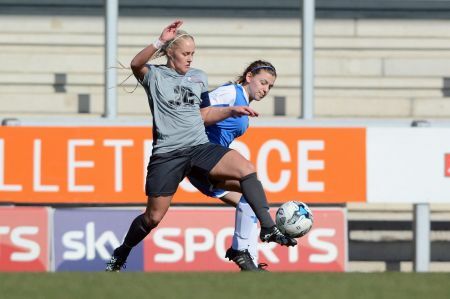 12th :: Women’s Super League Players to Support ESFA Girls’ U18 National Finals!